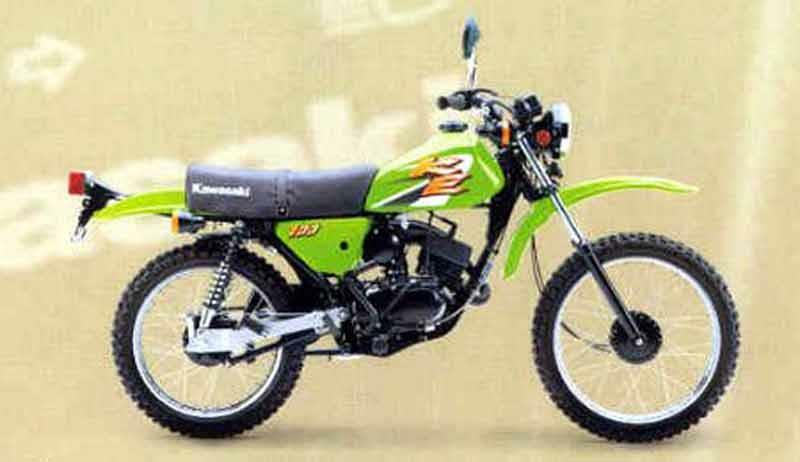 If you want basic transport, in a two stroke trail bike package, then the Kawasaki KE100 is arguably the template for the entire class. Starting life as the 100 G4 TR, it evolved into the KM100 and KE100, eventually killed off by looming emissions regulations in 1998. 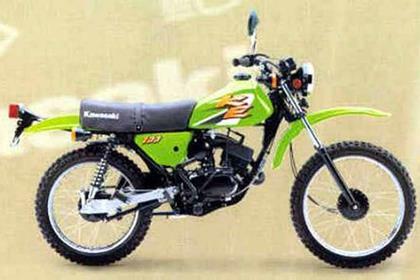 The lKawasaki KE100 has sightly dodgy brakes and electrics, but otherwise a tough, fun-sized trailbike. 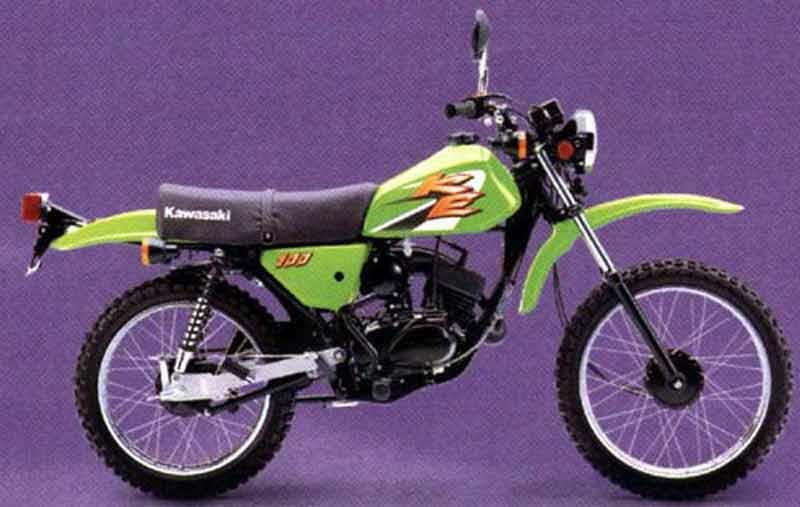 So long as you make allowances for riding a low tech, twin shock trailbike, then the Kawasaki KE100 does OK, either on or off-road. 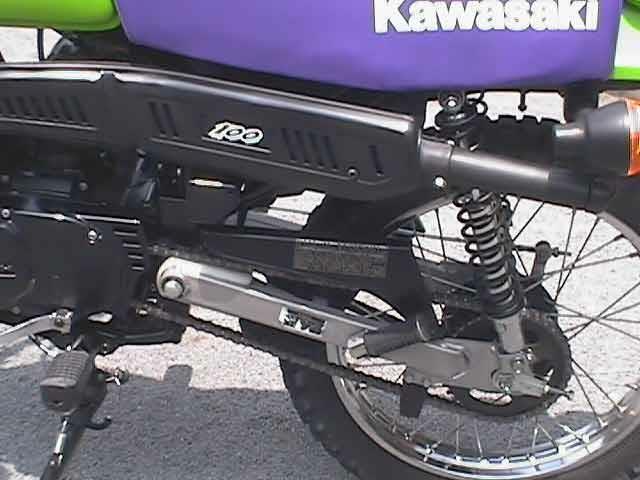 The Kawasaki KE100 rear shocks are renowned for their `bouncy castle' quality. Kawasaki KE100's skinny forks can pop their seals if you try serious off-road malarkey, or wheelies outside the chippy. The Kawasaki KE100's disc valve two stroke single was considered lively back in the mid 1970s, but nowadays it's just an average performer, although the low weight of the Kawasaki KE100 ( just 95kgs wet ) means acceleration is reasonably perky. The Kawasaki KE100 gets vibey above 50mph and a bit noisy too. 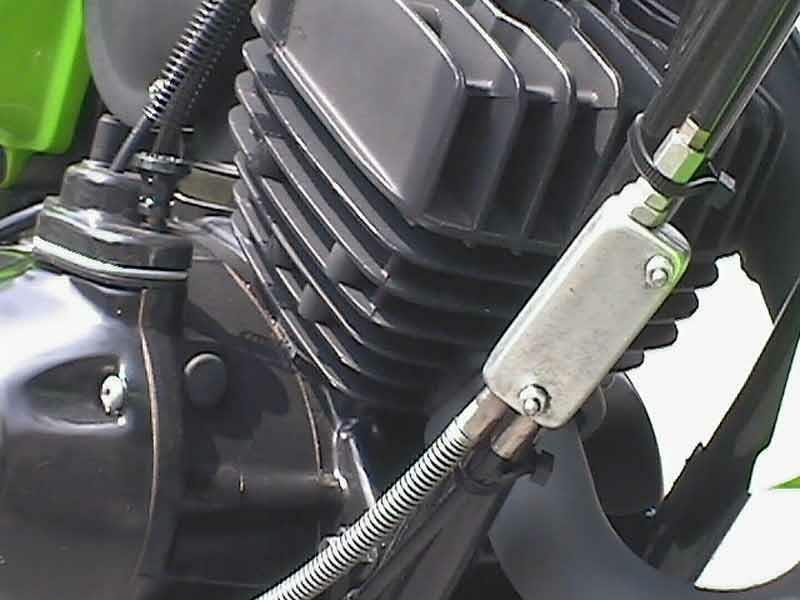 The 100cc Kawasaki stroker engines are tough and despite years of owner abuse, they can keep rasping along for decades, if you use some good quality two stroke oil. The Kawasaki KE100 chassis can suffer from rust, as the MX style mudguards allow bike and rider to be caked with crud if you do any wet weather riding. 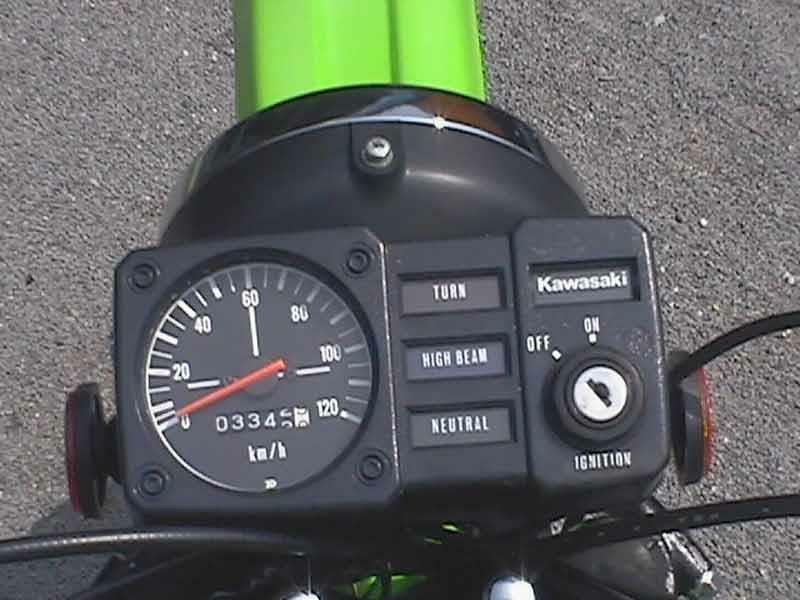 For what a Kawasaki KE100 /KM100 would cost used, you get a top fun back lanes hack, or town buzzbox, without worrying too much about resale values, or spares. 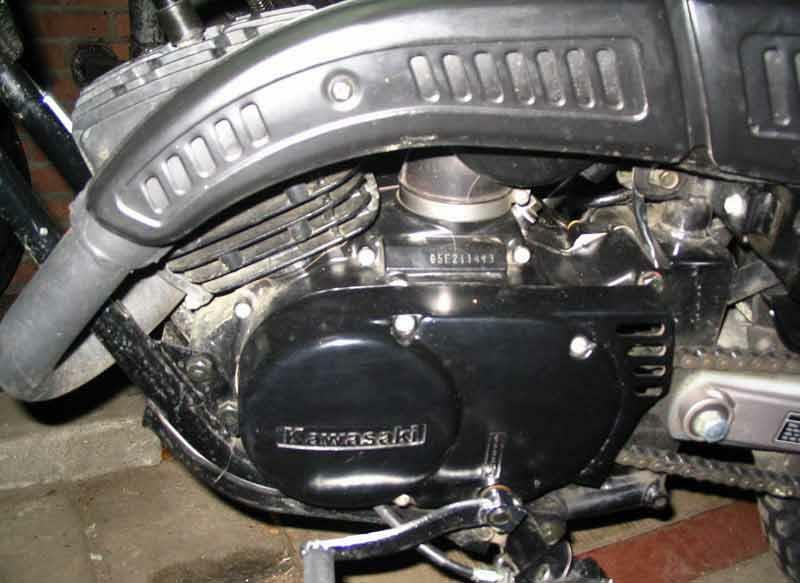 The Kawasaki KE100 engine was used in five or six different models during the 70s-90s, so there are plenty of bits to be had in breakers yards. 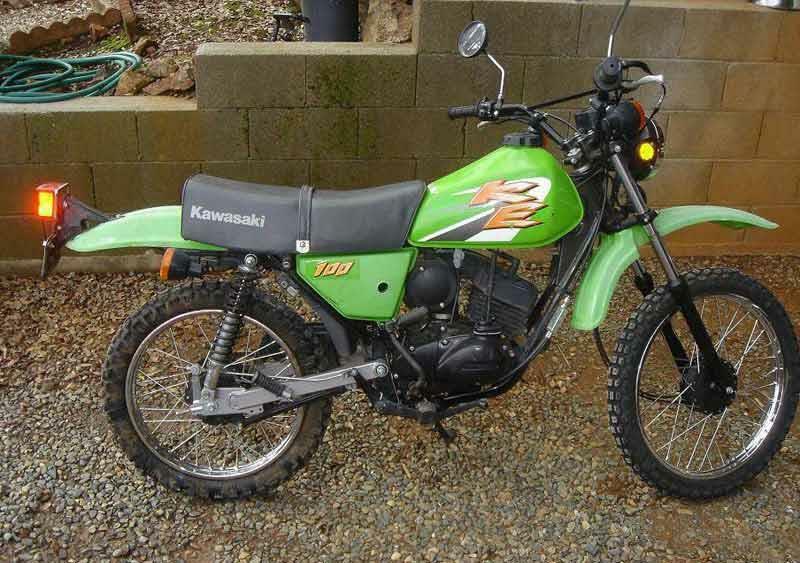 Find a Kawasaki KE100 for sale. The Kawasaki KE100 drum brakes are simply a liability on modern roads, they don't work at all well. Ditto the electrics, with the KE/KM100 Kawasakis suffering flat batteries if you insist on regularly using the indicators at night. On the upside, the Kawasaki KE100 's seat is wide, comfy and just big enough for two people to nip down to Thresher for a four pack of Kestrel lager. 1974: 100 G4 TR launched in UK. 1975: KH125 and KM100 appear in UK. 1975: G4 TR is repainted and designated Kawasaki KE100 . 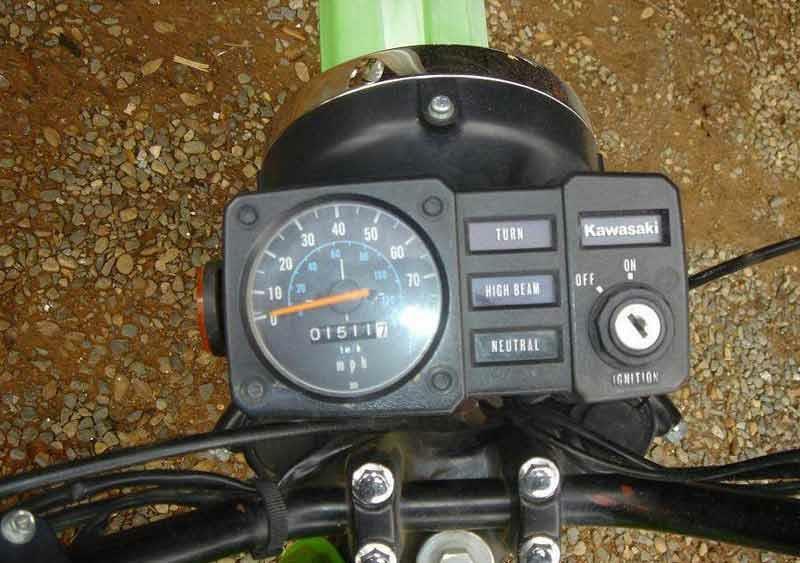 1983: Kawasaki KE100 gets new exhaust, clocks, seat and rear tailpiece. 1990: Kawasaki KE100 has new paint, gets a mirror. 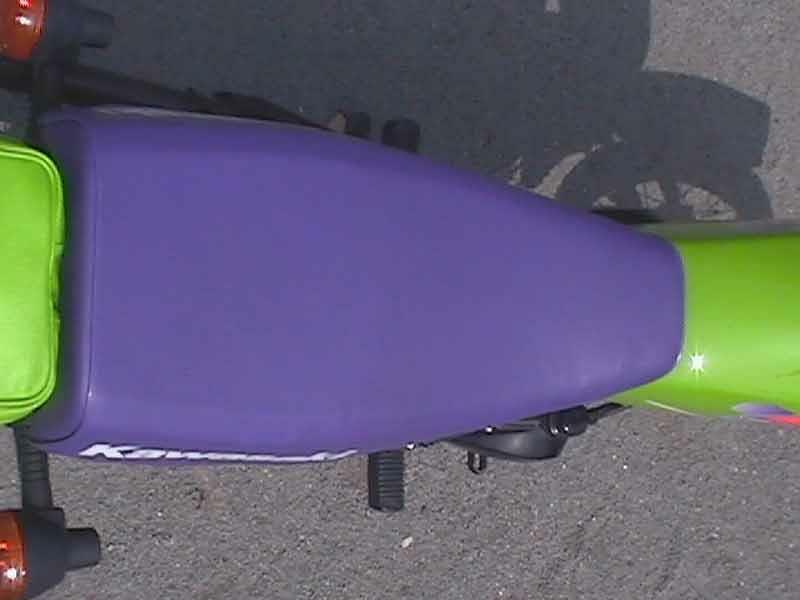 1996: More new colours for Kawasaki KE100 . KE125, 100 G4 TR, KM100. 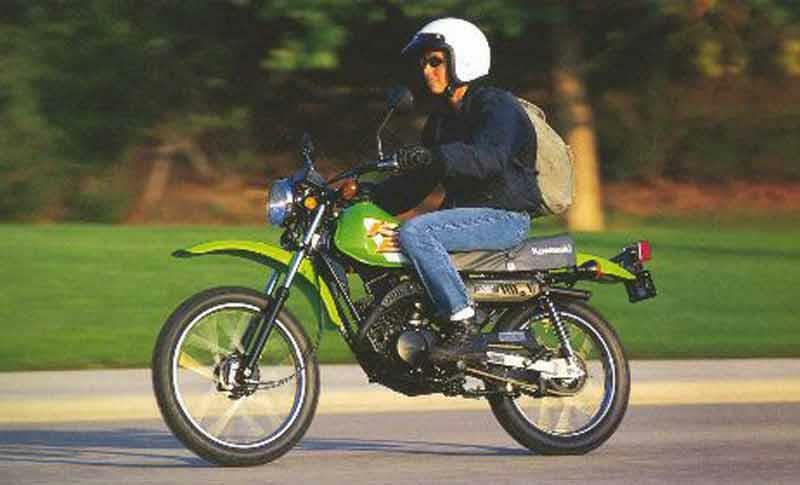 1 owner has reviewed their KAWASAKI KE100 (1974-1998) and rated it in a number of areas. Read what they have to say and what they like and dislike about the bike below. Mine's a 1991 model with 6K on the clock. Very comfortable ride, the suspension is surprisingly plush, perhaps a little wallowy on the tarmac but very nicely sprung for off road. The bike is physically tiny, not much bigger than a C90, which makes it very handy in mud and snow as you can just yank it about / pull it out of whatever it's stuck in. A rev counter would be nice. Performance is as good as any 100cc stroker. The disc valve intake arrangement gives a useable spread of torque, it's not necessary to rev the nuts off it the whole time. Acceleration is pretty good - realistic cruising speed is 50 MPH, I've seen an indicated 63MPH but I didn't spend long at that speed. Reliability is excellent, just set the points and decoke the baffle occasionally. There's nothing wrong with the brakes, they're no better or worse than any other drum brake commuter bike. The electrics are very good (for a 6V system anyway), the headlight is not particularly powerful but the indicators do actually work. It has a weird clutch lever pulls up the sidestand arrangement, but it works so it doesn't bother me. I had a TS125 (which kept breaking down) followed by a TS185 (which kept breaking down, then blew up), the KE is not as quick but it's a lot more trust-worthy.